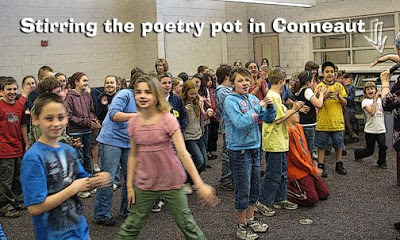 The kids at Lakeshore and Gateway Schools in Conneaut, OH were prepped and hoppin’ ready for poetry when I arrived this week. One teacher commented (caringly) that I must have my “gameface” on to be there working with the kids considering the tragic circumstances of these last weeks. And to tell the truth, I drove there thinking that I might have to paste on a smile — but that was not the case at all. We sat in the library (and the gym) and talked about the truth of poetry and connected eye-to-eye, nothing artificial. I heard rumors (you KNOW how teachers love to talk!) that kids were writing poetry AND becoming much more dramatic in their poetry performance after the assemblies at Gateway. I might have had a small hand in that (follow the arrow in the picture) but real kudos go to the teachers, media specialists and reading specialists who got the kids all jazzed before I got there. THANKS!